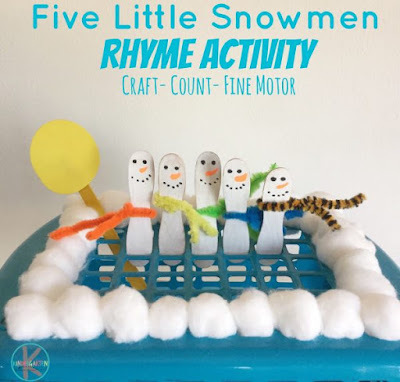 Continuing with our nursery rhyme learning activities, today we have this fun Snowmen Rhyme Activity to go along with the rhyme Five Little Snowmen. 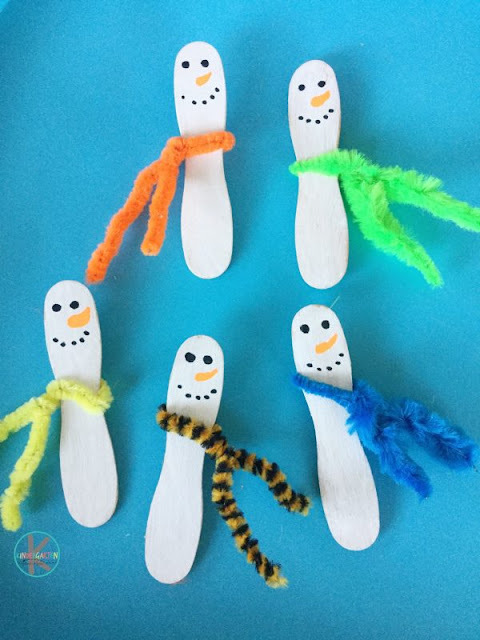 This activity involves a making a snowman craft, reciting the rhyme while counting, and improving fine motor coordination too. First make the snowmen. My kids enjoyed getting involved with this step. Paint or color the sticks white, then add the features(eyes, one, mouth). Lastly attach the pipe cleaners to the stick to resemble scarfs. You can add hats too if you’d like. Add the cotton wool around the basket. 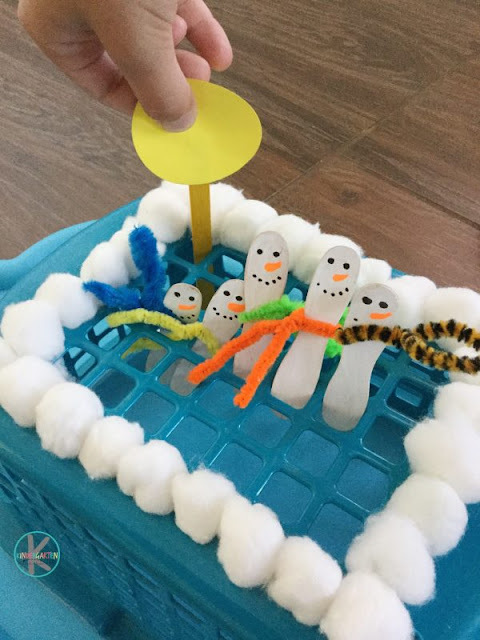 If you do not have a basket that will hold the sticks, you can use a cardboard box and cut some slits so that the sticks can stand and be pushed down. Make the sun with a yellow craft stick and round paper/ craft foam. Add to the basket. Ready to play? 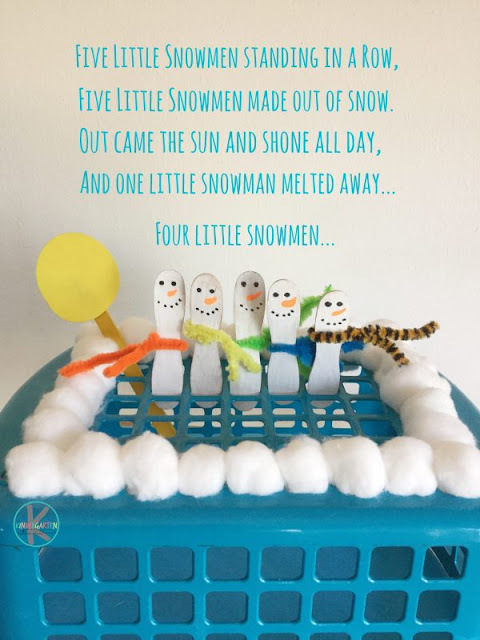 Recite the rhyme and push down a snowman every time the rhyme says “and one little snowman melted away”. Do this until “none little snowmen are here to stay”. This rhyme, in fact, teaches counting down, or subtracting from 5 to zero. 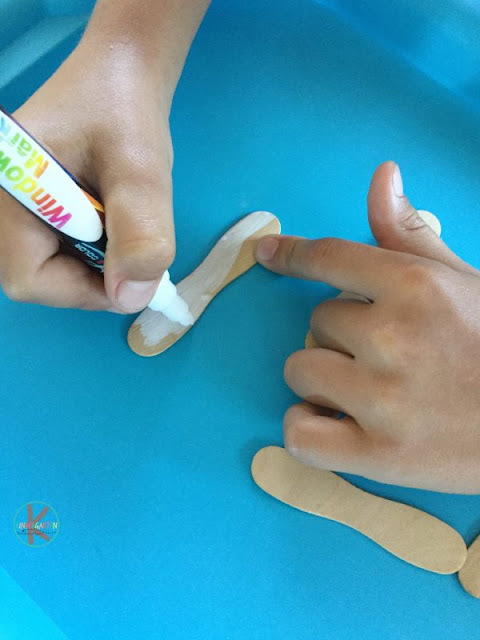 This rhyme activity is a hands-on way to demonstrate counting down while playing and what is better than playing while learning?